And today I want to offer you a small word of encouragement. – You are NOT wasting your time. What you’re doing DOES matter. Your labor is not in vain. How do you encourage yourself in the Lord during discouraging days? Leave a comment in the space below. 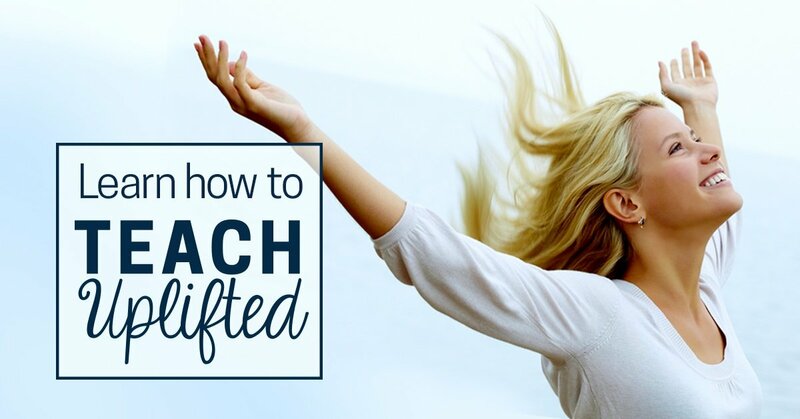 And consider joining us in Teach Uplifted, a six-week program designed to help you renew your passion for teaching by finding joy & peace in Christ. I needed this too. We have 30 school days and sometimes I just don’t know how I am going to make it. Thank you for this post, so frustrated with state testing this week and kids who just don’t care and tell me that they didn’t do their best. This unfortunately though will reflect on me and me alone. I needed to be reminded of my ultimate goal as a Christian. Thank you for this post. My thoughts on how to encourage teachers have been refreshed and renewed. I have to give words of encouragement to the teachers in the church cell group and this post is right in line with my thoughts and more. Praise God! 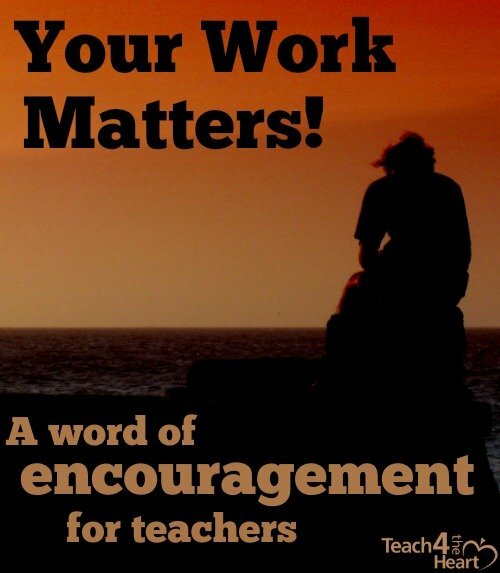 Teachers need encouragement. I know as I am a retired teacher who is a Christian. I will share this site with them. God bless you. I’m not a teacher yet, in my last year of school, but I have been teaching a unit on central messages this week and its so difficult to stay motivated because my students are really struggling. It seems that eventhough I have always wanted to be a teacher, this has really been an eye-opener and discourages me. I have students who even when I give them the correct answer, still don’t understand what I’m trying to teach. Reading this kind of boosted my mood and I think you fellow teachers for keeping your heads up to hold the others up. God bless you for your encouraging words. Thank you, thank you, thank you for helping to reset my perspective. I LOVE this article, shared it on my FB, and now I’m going to print it out to keep in my planning binder. I am sitting hear crying tears of joy. I have felt so discouraged and sad, but the Lord is truly faithful and I am so grateful to you for writing these words of encouragement. Thank you so much. The school I taught at for many years closed. I was blessed to be hired at a similar but larger school. I love teaching, students, and being able to share God’s message. However, the change has been very hard and I have felt like giving up. Tonight as I am again struggling, I read your message. Thank you. I need to change my perspective and allow God to guide me. Linda, this post came at the right time! Thank you, my beloved sister in Christ, for your encouraging words and all of the work that God is doing through you! Thank you so much for this words of encouragement. It’s has pulled me up. I teach for God not for the rewards. the bible says surely they shall gathered but it’s shall not amount to anything therefore they will scatter in Jesus name. Thanks so much!!! Everyone’s comments were very comforting and supportive!!! It’s so nice to know that there are other teachers out there that struggle with teaching and being confident as a teacher!!! Let’s all continue to use this site as a means to support, promote, and inspire each other!!! Great, powerful, and inspiring thoughts!!! Thank you for your continued words of encouragement. What a wonderful reminder of who we truly serve. I know that with the school I’m at, I also have to remind myself of who the real enemy is. It’s not the students, it’s not the administration, it’s not even the powers that be in the government. It’s the devil and I’m going to spiritual battle every day against him to the glory of God for my kids’ lives. So one more way for me to find encouragement is to put on the full armor of God and pray specifics over myself as I do so (such as asking that God help me to love my students the way He does when I put on the breastplate of righteousness). With this preparation and people like you who continually remind of the purpose we serve as teachers, I’m blessed to love the life I do. Again, thank you. Thank you Ms. Linda for spending your time in encouraging teachers, though I am not a full time teacher I can still relate to those kinds of things. you are one of God’s instrument. God bless you. Experiencing not only the craziness of the beginning of a new school year, but home life attacks that leave me wondering who are my support systems? God is in control. thank you for being my church family. This was so encouraging. The stress of transition to a new environment and kids that seem to be unconcerned, but I can go on in the name of God, for he is whom I labor for. Thanks. Thank you for the encouragement. I find myself constantly working through a to do list as a teacher, especially at the start of the new session. It is intense but it is worth it because we are trying to get it right for each child in our class. We live under an open heaven where God wants to pour out His blessing and love upon us so that we can bless others. Each child before me is a special creation made by Him and I am privileged to have some influence over their development and learning. Thank you for your faithfulness to encourage us, even when we don’t leave a reply to say we’ve read it and appreciate it and you. God reminded me today that many of the yokes and burdens I carry every day He didn’t put on me – I did. He only asks me to walk with Him, and He will carry the burden and place His yoke on me, which is easy, because He is carrying the other part of the yoke, and we are in this walk together. He will give me the grace I need to face what’s ahead, the time I need to accomplish the tasks He set before me, and the strength to keep walking with Him. Thank you for reminding me to keep my attention on Him – He cares for me, for you, for us, for our students and co-laborers. Thank you so much for this “word in season” (Isaiah 50:4). Came at just the right time! I’m not a teacher yet, one more semester of school left. But as I watch teachers leave school upset, grumpy, and unsatified I often wondered if I would eventually end up like them. They are great people but grumpy and unsatisfied by the weight of students who don’t care at the moment, parents who are upset with their teaching, & wondering why if they are making a difference. I am working in a kindergarten classroom this year and the teacher noticed my cross necklace. Immediately she mentioned this site. I am eternally grateful she did. I am reminded the real reason I am teaching & why it is so important to me. I feel like I am called to teaching because I love children deeply but I am doing it for Christ, no one else. He is the one who can judge me. This site, the podcasts, blog, and everything in between has reminded me that I can do it, it’s what I am called to do! I save the thank you notes I receive from students and parents, and then on a discouraging day I take them out and read them. One year on my birthday I read my whole file of notes instead of correcting papers for a birthday present to myself. My husband who taught 32 years in the public schools, taught me to keep my notes to read later. Thank you for your encouragement. I do feel called to teach here in a Christian school, and I thank God for the unity of the staff in approaching education with a Christian worldview. I want to say “Thank You” for your encouragement! It is so easy to get bogged down in all that teaching involves. I am so grateful that God is using you to help minister to teachers and encourage us to keep God at the forefront of all we do. It can be hard to remember these truths when we are swimming uphill every day, and I am thankful that you are a light we can look for to get us back on track to our true calling – following Jesus! What a blessing! to read something so encouraging about the Lord and he is the only one we have to answer to. Thank you for redirecting my focus towards serving God in my teaching and keeping Him as my number 1 priority and the provider of all my needs. Thank you very much for your the word of encouragement…. What a blessing!! These words of encouragement and all of the uplifting comments are right on time. It is always a good reminder to redirect our focus on the Lord instead of all of the distractions that Satan throws at us. We have to remember that teaching isn’t about us, or about our administrators, or even about the kids we teach, but rather it’s about glorifying God. Therefore, when we get discouraged, frustrated, and overwhelmed, we just need to shift our focus to God and remember the real reason why we teach. We teach because it’s our calling!!!!! Thank you for today’s message. I was really in need of encouragement.